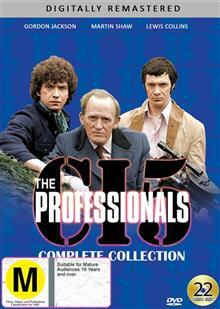 The Professionals....the iconic 1970's British TV series returns to your screen with all 57 episodes fully remastered. Featuring Martin Shaw, Gordon Jackson and Lewis Collins, this popular series ran for 57 action-packed episodes and made an immediate impact on British and then i... read full description below. The Professionals....the iconic 1970's British TV series returns to your screen with all 57 episodes fully remastered. Featuring Martin Shaw, Gordon Jackson and Lewis Collins, this popular series ran for 57 action-packed episodes and made an immediate impact on British and then international audiences which has continued for 35 years. Painstakingly restored from the camera-original negatives this could have been made yesterday. This DVD set contains all 57 Episodes on 22 DVDs from all five seasons.